There’s probably not a single Android developer in the wild that hasn’t heard about Material design yet. One of my favorite elements are subtle icon transitions, like the ones presented in delightful details. Starting a redesign of my app, a menu to back-arrow icon - like the one in the top left corner - would come handy. I thought recreating it from scratch would be a great how-to exercise. TL;DR Here’s the GitHub repo. Points will help us define the transition. Points C and D are roughly equal to T and U, so we’ll only focus on the bold ones. Rememeber the variable names, as they will be used throughout this post. To get a smooth transition from e.g. A to S, we have to know the inbetween point at each animation frame. But first, we have to decide how to track animation progress. Assuming we’ll use property animation, it’s on us to provide a property and set of values we want to animate between. If progress is 0, we show the menu icon. Else if progress is 1, we show the back-arrow icon. Progressing from 0 to 1 transforms a home icon to a back-arrow. Conversely, 1 to 0 goes from a back-arrow to home. Remember, the points we refer to are all defined in the upper section. 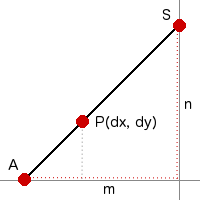 P is the point at progress $0 < q < 1$, moving between A and S. We want to know $dx$ and $dy$. 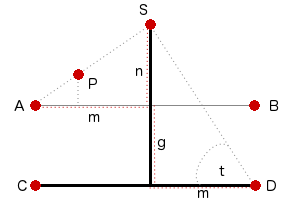 Since $h$ is of the same length as the diagonal of a square with an edge $m$, we deduct $z=m$, thus $n = (m-g)$ and $S=(m, (m-g))$. Note that C-D line (or T-U) is a mirror line. As such, reflecting the $y$ coordinate gets us E-F line changes for free. To read more about the approach we’ve taken, visit the linear interpolation wiki page. As mentioned, both drawable states have only three simple lines. Canvas has a convenient method drawLine, which is all we need. To be able to draw, we need to calculate dx, dy and dv and know points A, B, C, D, E, F.
First three change when progress changes, but others just need bounds. We can compute them in a helper method, which is only invoked when the bounds are set. Note that we apply the transformations computed in the math section. If progress is 1, the above widget reveals the pointy end of the arrow is not really pointy. When drawing on a Canvas instance, Android uses Skia, a 2D graphics library, to do the actual drawing. Canvas.drawLine invokes a native method SkCanvas::drawLine, which invokes SkCanvas::onDrawPoints. Because our mPaint instance is not complex (it has no path effects, for example), SkPaint::doComputeFastBounds is called. We care because in this case, if the mPaint stroke width is $w$, the rendered point has a radius of $w/2$. Line A-B (S-U) is colored purple. Line E-F (V-U) is colored green. Red square is the issue we're trying to resolve. 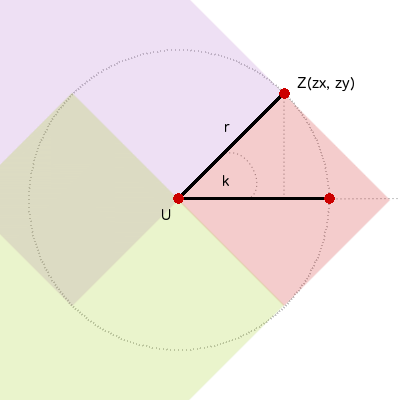 If we offset B and F by $(zx, -zy), (zx, zy)$ respectively, we cover the red square. Good on ya for making it this far. I hope math section was clear enough, and the widgets helped. I’m sure some parts can be improved, so I’ll be grateful for any feedback I get. The full implementation is available on GitHub.